This isn’t popular knowledge but I recently completed a undergraduate degree in Biology. As part of this degree I undertook a project that aimed to produce a scientific paper. For my project I chose to study captive California Sea Lions; in particular, “Encouraging natural vibrissae movements in California sea lions (Zalophus californianus) using fish-catching as an enrichment behaviour”. In this post, I’m gonna write a quick run down of what I discovered in my research in the hope of inspiring people to see just how amazing whiskers are!! In recent years, the welfare of captive marine mammals has been called into question. I chose to study California sea lions because most current research had focused on phocids (or true seals) (Dehnhardt and Kaminski, 1995; Dehnhardt, Mauck et al., 2001; Hanke, Wieskotten et al., 2013) and I studied whiskers because they function as tactile receptors and are used when sea lions hunt in the wild (Berta, Sumich et al., 2005). Dehnhardt and Kaminski, 1995 studied the sensitivity of mystacial whiskers of harbour seals (Phoca vitulina) when they were actively touching different sized objects. This particular study found that the harbour seals were able to differentiate between the different sized objects using just their whiskers. Then Dehnhardt, Mauck et al., 2001 found that harbour seals were also amazing capable of following hydrodynamic trails left by a miniature submarine. Although, California sea lions and harbour seals are closely related, they are not the same species and nor do they share identical behaviours and lifestyles. Therefore, it is possible that the results of the above studies can not also be applied to the California sea lions. It was for this reason I chose to study the sea lions to see if the impressiveness of the whiskers of seals could also be proven with California sea lions. In my study I used fish catching to mimic naturalistic whisker movements in the California sea lions. My particular study found that sea lions exhibit differences between individuals when using whiskers during fish catching. 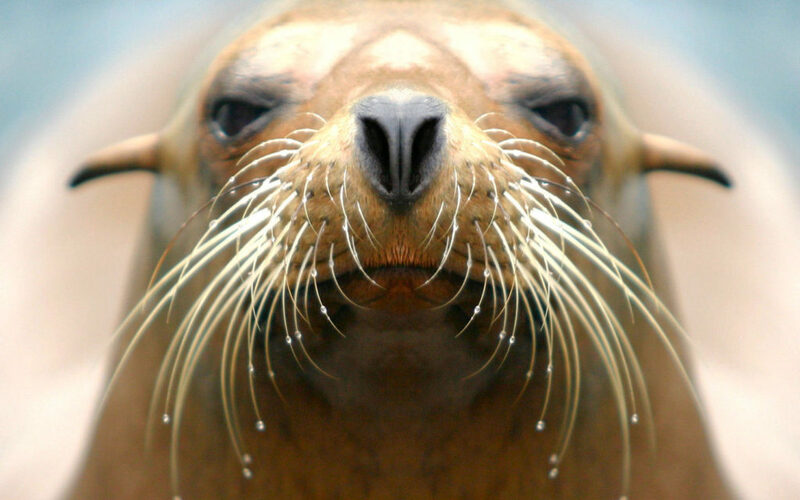 It also found that sea lion use their whiskers as guidance during fish catching behaviours, this was obvious from the results as the whisker asymmetry had a stronger correlation to fish orientation than head orientation did. Being able to guide fish into their mouths is a vital skills for sea lions as it allows them to hunt for prey (Stephens, Beebe et al. 1973), the same is also true for other pinnipeds such as seals (Riedman, 1990; Hyvarinen, Palvianen et al. 2009). Animals can actively regulate the movements and positions of their sensory organs to improve the quality of the sensory information they are receiving (Grant, Mitchinson et al. 2009). Therefore, whiskers are an extremely important sensory system for pinnipeds; the whiskers are possibly more of a sensing organ than eyes. Gläser et al. (2011) compared California sea lions to harbour seals and discovered that even though sea lions have non-specialised whiskers when compared to harbour seals, they were still able to perform to a high level when following hydrodynamic trails. Previous studies have shown that dynamic sensorimotor tasks have encouraged more whisker movements in California sea lions (Milne and Grant, 2014) and if whisker movements are a natural behaviour of sea lions (Gläser, Wieskotten et al. 2011) then these dynamic tasks are providing more enrichment to the captive sea lions. However, that particular study used ball-balancing as the enrichment behaviour and although this elicited intense whisker movements from the sea lions, it is not a naturalistic behaviour that the sea lions would encounter in the wild. If you want to read my full research project it is attached below. Encouraging natural vibrissae movements in California sea lions (Zalophus californianus) using fish-catching as an enrichment behaviour.